​Welcome to my website, where you can find out more about me and the work I do. I provide PR and communications support in the charity sector. In the gaps between the day job I run a literary festival, write features and read a lot of books. ​I’m also a novelist. 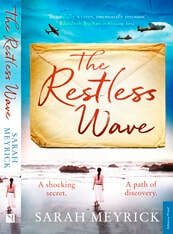 My first novel, Knowing Anna, was published in June 2016.​ My new book, The Restless Wave, will be published in May 2019.
which gave me a fascination for the stories people tell and the worlds they inhabit. I have worked variously as a journalist, editor and PR professional. I am the Director of the Bloxham Festival of Faith and Literature which is a small literary festival that takes place in north Oxfordshire near Banbury. We describe it as “a literary festival with a theological slant” and our mission is to encourage a love of literature as it relates to faith; to bring together authors and those who appreciate their work; and to create a thoughtful and relaxing space in which to consider works of literature and their religious themes. I live in Oxfordshire with my husband and we have two grown up children.